When a patient comes in with a fatal head bleed, that first conversation with a neurosurgeon may forever color how the family remembers the death, from a peaceful letting go (“Maybe it was his time”) to an open sore of regret (“Those doctors didn’t listen! They didn’t even try to save him!”) When there’s no place for the scalpel, words are the surgeon’s only tool. Extracts from When breath becomes air, Paul Kalanithi (1977-2015). Defeated by events that are beyond a surgeon’s control, Paul, a highly acclaimed neurosurgeon and researcher, admits to us that words can sometimes be the surgeon’s only tool. A tool that he was naturally skilled at using, both, as a writer and as a neurosurgeon. ‘When breath becomes air’ is his life’s story – his experience as a surgeon and as a patient. 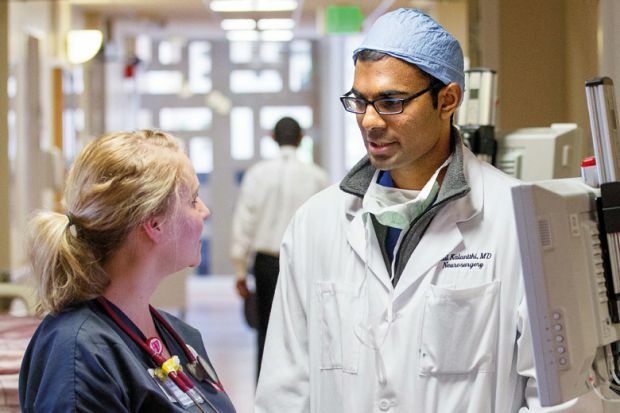 Paul Kalanithi also studied English Literature, Human Biology and Philosophy. He doesn’t leave any important characters in his life unmentioned in the book. With unwavering support from his family and friends, he wrote the book while battling with stage IV metastatic lung cancer. I took meager solace in knowing that William Carlos Williams and Richard Selzer had confessed to doing worse, and I swore to do better. Amid the tragedies and failures, I feared I was losing sight of the singular importance of human relationships, not between patients and their families but between doctor and patient. Technical excellence was not enough. As a resident, my highest ideal was not saving lives – everyone dies eventually – but guiding a patient or family to an understanding of death or illness. Paul was a distinctive surgeon who reflected back on lessons he learnt from his life, his literary quests and philosophical realisations, to apply them back into medical practice. When breath becomes air is a valuable gift to the medical world that he generously leaves behind. When Breath Becomes Air could be found at a library or bookstore near you. What makes life worth living in the face of death – Lucy Kalanithi TED talk. In the room I had pronounced patients dead – Another extract from the book When breath becomes air. Featured image – Paul speaking to a colleague at Stanford hospital, photograph taken by Norbert von der Groeben. He who steals an egg will steal more.